Occasionally a party collecting on a debt or resisting collection may commit a wrong against another that gives rise to a tort action. Client was assaulted by a bailiff who was repossessing goods. Client’s car was taken from their property by a bailiff or court bailiff. Torts are civil wrongs committed by one person against another for which the law will give a remedy. Torts have developed over many centuries through common-law court decisions. Torts have some parallels with, but are separate from, criminal law. For example, intentionally hitting someone can be a criminal offence of assault, but also a tort of battery. As a criminal matter, the person committing the act may be prosecuted. As a civil matter, the person who was hit may be able to sue the person who did the hitting for damages. This lawsuit would be a tort action. This section introduces areas of tort law particularly relevant in consumer or debt situations. Historically, an assault was defined in common law as any situation where a wrongdoer instills in the victim the fear that they will be struck or otherwise physically attacked. No direct force need be applied to the victim so long as the threat can genuinely make a reasonable person afraid of being injured. The tort of battery occurs when actual violence is applied against the victim, although the violence need not be substantial. Although the distinction between assault and battery is maintained in tort law, common usage calls both wrongs an assault. Deciding who is in the right and who is in the wrong in any confrontation (and, in particular, when the debtor is entitled to resist) involves considering a number of legal principles. A key consideration is the location of the confrontation. Often, the confrontation occurs at or around the residence of the debtor. In general, a debtor is entitled to resist any entry to their own residence. A residence includes a house or apartment, as well as immediately adjacent buildings or parts of the residence, such as a garage. This principle certainly applies to bailiffs, and it also appears to apply to some situations involving court bailiffs. The debtor must indicate that they are not giving consent to the repossession or seizure. The debtor can refuse entry to their residence or property, or request that the person who has entered has to leave. Thus, if a bailiff ignored a refusal of entry to premises and pushed past a debtor to take goods, the debtor would probably be justified in attempting to eject the bailiff. The act of pushing past, and of any subsequent physical confrontation, would probably be considered a civil assault on the part of the bailiff, for which the debtor could seek damages. A debtor’s resistance must be reasonable under the circumstances. Resistance with a weapon, for example, would probably be considered unreasonable. A possible limitation to the debtor’s right to resist might be where the person attempting to repossess or seize, probably with police officers or sheriffs in attendance, is enforcing a specific order of the court, which specifically ordered the debtor to give up certain property. This type of order might be sought, in fairly rare circumstances, where a debtor had initially resisted entry to property either by a bailiff or a court bailiff, and where the creditor had, with notice to the debtor, obtained a further order of the court. The debtor’s right to physically resist a bailiff or court bailiff has repercussions in both civil and criminal law. In criminal law, it usually means that the debtor can use reasonable force in resisting when appropriate. The debtor may well have a valid legal defence to any criminal charge arising from an incident under these circumstances. This also means that bailiffs or court bailiffs themselves could be charged with assault for any force that they used against the debtor, where the debtor had made it clear they were resisting actions against the debtor’s property. In civil law, it would mean that the debtor has a cause of action to sue the bailiff or court bailiff for damages. There is some important case law that guides and illustrates these principles. In the Ontario case of R. v. Doucette, three bailiffs, acting on behalf of a secured creditor, hit a debtor while they were attempting to repossess a television from his apartment. The bailiffs were convicted of criminal assault, where it was clear that the debtor was not exerting unreasonable force in resisting and where he had clearly communicated a demand for the bailiffs to leave his apartment. In the BC case of R. v. Todd, a debtor was convicted of common assault on a police officer who had accompanied a bailiff to repossess a truck from the debtor. In the course of resisting the repossession, the debtor hit the officer in the head and kicked him in the groin. The court determined that the force used by the debtor in resisting was excessive. In an older BC civil case called Roman v. Motorcar Loan Company Limited and Burns, the debtor was hit while a bailiff was attempting to repossess a car from the debtor’s garage. The debtor recovered damages against the bailiff. The BC Court of Appeal held, on the particular facts of the case, that while the bailiff was liable for damages, the creditor should not be held vicariously liable for the acts of the bailiff. 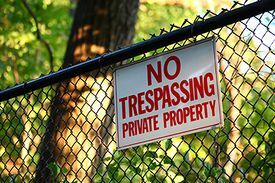 Trespass is a very broad legal concept. Basically, it is the wrongful interference with a debtor’s property. This includes wrongly taking a debtor’s chattels, and wrongly entering or remaining on a debtor’s property. Wrongly entering or remaining on a debtor’s property usually justifies a debtor’s reasonable attempts at removing the person from their property. If there is resistance to the removal, it is the trespasser who is in the wrong, and the debtor may be able to claim damages for both trespass to property and assault. the circumstances under which the creditor took the chattel. A creditor’s right to repossess usually arises from a security agreement. That right must be exercised within the limits of the Personal Property Security Act (see the section on Security Agreements), as well as other statutes such as the Business Practices and Consumer Protection Act. The most basic mistake that a creditor can make is to have the wrong goods seized. For example, if furniture that is owned by a friend or relative of the debtor is taken as part of a repossession by a bailiff, the rightful owner of the goods will have a right to claim the return of the goods, or damages, or possibly both, from the creditor. Note, however, that the courts are often wary of other people coming forward to claim ownership of goods that are in the possession of a debtor. It may be up to the person claiming ownership to prove to the satisfaction of the court they are indeed the rightful owner of the goods. There are numerous instances in which a creditor’s belief in their right to repossession may be mistaken or wrong, and where a debtor may have a right to sue for trespass to chattels. For example, the security agreement and the common law of contract usually say that the creditor cannot repossess unless there is a default in payment. If a creditor missed crediting a payment made on time by the debtor, and subsequently repossessed a car, the creditor would probably be liable for damages for wrongly taking the car. If a creditor accepts a late payment from a debtor, the law may imply that the creditor has given up a right of repossession until there is another default. If a creditor’s employee gives a debtor a verbal extension of time to make a payment, a repossession within that extension period may be considered wrongful. The statute law sets a number of limits on repossession. If those limits are broken, the debtor may have a cause of action for trespass to chattels. For example, the Personal Property Security Act, section 58, says that creditors cannot repossess secured consumer goods where a debtor has paid at least two-thirds of the total amount secured (that is, two-thirds of what is owed on those goods), unless they get a court order first. A repossession without such a court order would probably be considered a trespass to the chattel, for which the debtor could recover damages. Possible wrongful repossessions where statutory requirements had not been complied with would also exist under the Repairers Lien Act (see the section on Repairers’ Liens). If the person carrying out a repossession lacks the proper authority, it can give rise to a cause of action for trespass. In the case of Re Bad Boy Mobile Homes Ltd., the court held that a repossession made by a person who was not licensed as a bailiff was unlawful (the repossession had been carried out by an employee of the creditor). An extension of this principle may be that a debtor would be entitled to damages for wrongful repossession, and possibly to the return of any goods taken, where it could be shown the repossession was carried out by an unlicensed person. This situation is illustrated by the case of Millar v. Sumo Engine Co. (Canada) (1989) Ltd. (see below). Where there has been a trespass to land, the repossession of chattels may be considered wrongful. A trespass to a debtor’s residence is usually wrongful in the absence of consent by the debtor. The debtor may have a cause of action for damages for trespass, and the debtor may have a right to have the goods returned. This issue usually arises when bailiffs attempt to repossess motor vehicles on behalf of secured creditors or repairers. In Millar v. Sumo Engine Co. (Canada) (1989) Ltd., a bailiff, acting on the direction of a creditor who claimed a repairer’s lien over a debtor’s car, repossessed it from a locked apartment garage by sneaking in behind another tenant who had activated the garage door. The court held that the locked garage was part of the debtor’s dwelling house. Since there was no consent to entry, both the entry and the repossession were unlawful, and the court ordered the car returned. However, in Shane v. Kazakoff, the court said it was not unlawful to peacefully repossess a car from the driveway of private property. The Business Practices and Consumer Protection Act, section 122, prohibits bailiffs (but not sheriffs, who are exempted by the Debt Collection Industry Regulation, section 2(1)) from repossessing chattels unless the debtor, a spouse, the debtor’s agent, or an adult resident in the debtor’s dwelling is present. So, if a bailiff entered a debtor’s house while no one was home and took secured goods, the debtor would have a cause of action for damages resulting from a breach of the statute. This right would likely arise in common law and certainly arises specifically under the Business Practices and Consumer Protection Act, section 171. Clients may be seeking advice on confrontation-type situations either before or after an incident. If an incident has not happened, but the client is asking “what if” type questions, advocates should direct their fact gathering (and advice) toward helping the client avoid a confrontation. This includes getting a full picture of the client’s financial circumstances and as much detail as possible on the actions of the creditor (for example, what threats have been made). If an incident has occurred, advocates should be careful to quickly determine if the situation has stabilized — for example, is the bailiff intending to return? are criminal charges pending against anyone? Advocates should be very careful when giving advice to clients who are asking “what if” type questions on such issues as how much force is reasonable in resisting a bailiff. The focus of advice should not be on how far a debtor can resist should a confrontation occur; rather, it should be on how the confrontation can be avoided through resolving the underlying financial or contractual problem. The fundamental question for a debtor when they are considering any of these remedies is whether it is worthwhile to take action. For example, the debtor should understand that taking a court action, whether in Small Claims Court or in Supreme Court, will likely be time-consuming and the outcome is never certain. The debtor’s initial upset and desire for compensation may wane in the face of waiting a long time for the matter to be resolved in the court system. However, it may well be that the court will demonstrate considerable sympathy to the debtor’s circumstances, particularly where the facts show that the creditor or bailiff has acted in an unreasonable or oppressive manner. Where the facts are favourable to the debtor, the creditor may well decide that it is financially prudent to settle an action for damages before the matter goes to trial. The value to a debtor who brings such an action is they will gain some bargaining advantage to reduce or eliminate the debt to the creditor as a set-off to the damages that might be awarded for the tort of the creditor. Where the creditor did have a right to repossess, but where the repossession was carried out in a wrongful manner, the debtor may well decide that it is better just to leave matters as they are. For example, if a debtor was in default of a car payment with little likelihood of being able to continue the payments, and if, under the seize or sue provisions of the Personal Property Security Act, the debtor is no longer indebted to the creditor, the debtor may feel that it is impractical to seek the return of the vehicle. Complaints to the police may be a remedy in more blatant situations, particularly where there has been actual physical contact between the parties. Complaints to a licensing body may also be a remedy in more blatant situations, where it may be that there is a continuing course of conduct such that the licence of the bailiff might be suspended. This page was last edited on 13 October 2018, at 09:38.